Steve: Hi, I'm Steve Lancia. Northcamp Survival School started somewhere around 2008. I knew I had this knowledge and skill and resources and land and I just wanted to share it with people. There's a lot of people out there that need to get out of the cities and into the woods a lot more often. Marcus: Great. Tell us a little bit about some of the courses that you run and some of the space you've got here. Steve: Okay. We have three or four different courses. We have a three-hour basic survival introduction class, which for the most part, teaches people about the psychology of survival, the I can attitude, we get into the rules of three. The rules of three dictate survival priorities under most circumstances, which should be first aid, shelter, fire, water, signaling, and food. We do a three-hour class of that, and then we have a weekend wilderness class which is that but it's a lot more hands-on. For me, it's taken a lifetime to learn and master some of these skills. You can't learn them all. I can't give them to you in three hours. A weekend is better. If we had three weeks together, that would be better yet. Marcus: Yes, great. Awesome. Thank you, Steve. Marcus: If you want to see Steve and learn more about Northcamp Survival School’s programs, come to the New England Bushcraft Show and you can find out more information at www.newenglandbushcraft.org. Marcus: Hi, everybody, Marcus here from the New England Bushcraft Show. I'm here with Steve Lancia from Northcamp Survival. We're doing a bit of a Q&A. Steve, tell me a little bit about what the term bushcraft means to you or what you think of when somebody says the word bushcraft to you. Steve: Sure. Well, bushcraft, by nature, has been around forever. It's the way cavemen lived. It’s the way our ancestors lived, native peoples. Bushcraft is exactly what it says. I believe it's taking something from the bush, something from nature, something from the woods, and crafting what you need from it. Whether it be a wooden spoon that we were making and talking about earlier. That comes from the trees. It's local resources. That's what it is. We're not going to the store to buy, you have to make the way people did 400 years ago. Marcus: Cool. With your knowledge of bushcraft and the people that you see in your programs, what type of person does bushcraft become interested to? Who's interested in bushcraft or who could or should be interested in bushcraft? Steve: Well, I think everyone should be interested in it. I think women by nature are a lot more crafty and maybe creative. I find a lot of women coming to school and they've got skills. They can sometimes get the fire going before the rest of us. So, it's for everyone. Marcus: Awesome, thanks. 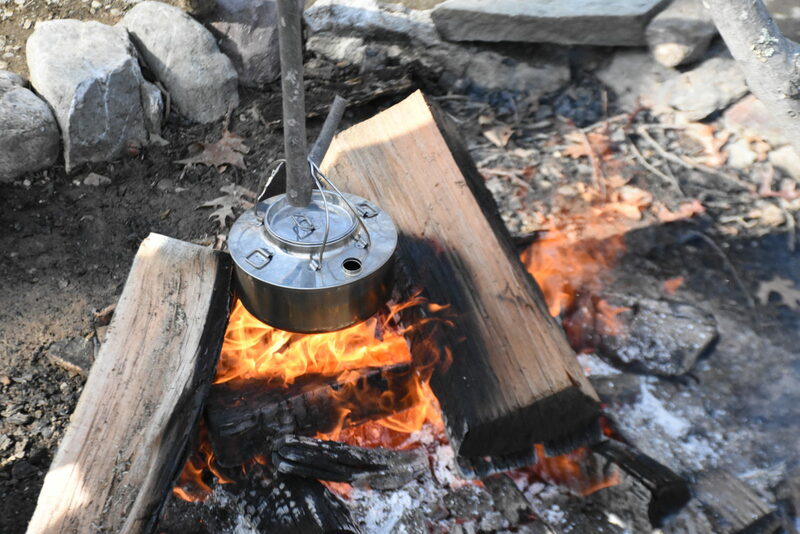 If you want to learn more about bushcraft and also meet with Steve and learn more about North Camp Survival School, please join us at the New England Bushcraft Show, www.newenglandbushcraft.org. Marcus: Hi, this is Marcus with the New England Bushcraft Show. I'm here today with Steve Lancia from Northcamp Survival School. Steve, I reached out to a couple of different wilderness skills and survival school programs in the area and you were one of the early people that wrote back to me saying that, "this is great. I want to see you do this market. How can I help?" Marcus: Tell me, what is it that excites you about the show and the community we have here? Steve: What excites me most is that you've grabbed the bull by the horns essentially. No one in the area has such a show. I don't even know of many in the United States. I know there's a couple down in Texas and such. So, to have a show spearheaded here in the northeast in New England is just phenomenal. It's going to bring people together. It's going to bring people that know nothing about it into our venue to see what it is or, "What is bushcraft? What is this all about? How can I benefit from it? What can I learn? What can I add, for that matter?" I'm very excited and I can only see it grow from here. Marcus: Awesome. Well, thank you. We're excited to have you a part of it. Marcus: If you want to learn more about bushcraft and learn more about the New England Bushcraft Show, go to our website www.newenglandbushcraft.org. Marcus: Hi everybody. This is Marcus with the New England Bushcraft Show. I'm here with Steve Lancia from Northcamp Survival. Steve, you're going to be joining us at the New England Bushcraft Show. Tell me a little bit about what you will be sharing with the audience that comes to the event. Steve: I think the specialty that I'm going to be bringing to the table, Marcus, is wilderness medicine or bushcraft medicine, which essentially doesn't differ that much from any other traditional forms of first aid or medicine. The difference is you're thinking out of the box. Okay, we're improvising with materials that we get from-- resource from the woods and from nature. There is no ambulance. You might not have all these medicines that come from the drugstore. We can work with some of the local flora and that sort of thing. See things for what they can be, not just for what they are. Getting people to think out of the box, being resourceful with what is afforded by your surroundings, bushcraft medicine.